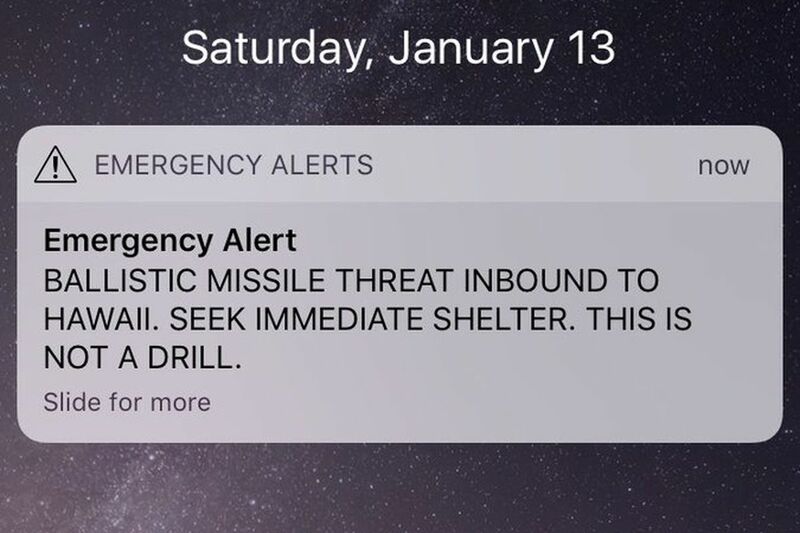 On Saturday morning, residents of Hawaii received an emergency alert on their phones: “Ballistic missile threat inbound to Hawaii. Seek immediate shelter. This is not a drill.” Hawaiians panicked, believing they were the target of a nuclear attack. Some ran into basements, others under tables; some even climbed down manholes in the street. For 38 minutes, 1.4 million people scrambled to secure their safety, but they also did something else. Thinking a catastrophic attack was imminent, they were forced to consider how they wanted to spend their last moments on Earth. Thank God, the warning was a false alarm and the extent of the damage was the anxiety it unnecessarily caused. Nevertheless, there is a lesson for all of us in their unfortunate experience. If you had 38 minutes to live, how would you spend them? What would you do? Would you reach for a siddur or a tehillim? Would you open a Torah text and study? Would you reach for the phone to tell someone you love them? Would you contact someone from whom you have become alienated in order to reconcile? What would you do if you thought you had a limited amount of time to live? And why aren’t you doing it now? Hillel cautioned us (Pirkei Avos 2:5), “al tomar l’chesha’ipaneh eshneh, shema lo tipaneh, don’t say ‘when I have free time I will learn’, for you may never have free time.” We cannot predict the length of our lives and if we procrastinate and delay we may never in fact get to what we claim are our goals and aspirations. Our parsha cautions, “U’shemartem es ha’matzos, guard the matzah from becoming chametz.” Rashi quotes the Midrash that encourages us to read the verse as if it were punctuated u’shemartem es ha’mitzvos, safeguard the commandments. Mitzvah ha’bah l’yadecha al tachmitzena, if a positive opportunity comes your way, don’t allow it to turn into chametz through procrastination and laziness. Rather, embrace it, run with it, and do it right away, before it is too late. An insightful country song includes a powerful chorus, “Someday I hope you get the chance to live like you were dying.” The people of Hawaii had that chance last week. We don’t need to wait to get an urgent alert. Ask yourself what you would do with minutes to live and then don’t wait, do it right now.